May 2018. © The Network of African Science Academies 2018. National academies of science have a long tradition of engaging widely in strengthening the evidence base to underpin the delivery of enhanced food and nutrition security at regional and national levels. 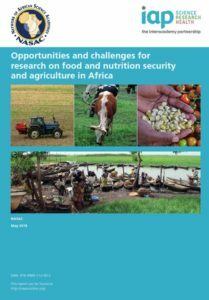 NASAC, the Network of African Science Academies, has developed a food nutrition and agriculture (FNSA) report for audiences in Africa as a contribution to the project worldwide initiated by IAP, the InterAcademy Partnership, the global network of science academies. The IAP work brings together regional perspectives in parallel from Africa, Asia, the Americas and Europe on the opportunities for the science–policy interface, identifying how research can contribute to resolving challenges for agriculture, food systems and nutrition. The messages in the report are aimed at national policymakers, member academies, the scientific community and other stakeholders in Africa.